Custom Recovery, in an Android, is much more advanced as may be compared to stock Recovery. While that could only be by build, custom recovery might be necessary to repair or restore any Android device back to its normal condition sometimes. Here, we discuss all the possible methods you can deploy to flash custom recovery on HTC Android devices. Since HTC Android devices are more complicated yet friendly to modify (re-engineer), except the conditions are met, not all methods for flashing images such recovery, radio among other files (on HTC Android devices) are suitable for all HTC devices. In the paragraphs that follow below here, one after another, we discuss different methods you can deploy to flash custom recovery on HTC Android devices. 3. Download the custom recovery file for your HTC device and move (copy) it to the same folder as your Stripped ADB Tools. TWRP recovery seems to be the last man standing in the Android custom recovery world. 4. 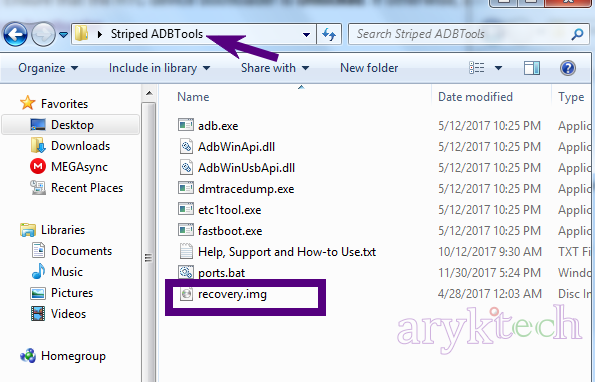 Go to the (Stripped) ADB Tools folder in the Step 2 above and open Command Prompt in that window. While in the Stripped ADB and Fastboot Tools folder, press and hold the Shift + Right-click keys, then select Open command prompt here from the options that appear. 5. Boot your HTC device to bootloader mode and connect it to the PC. Power off or remove battery from the device then, press and hold the Power + Volume Down buttons together for few seconds or until the screen shows up. Release both keys and tap the Power button once. You are now in Bootloader mode! a. Type the commands above one after another. b. Press the enter key after each command. c. Remember to rename your custom recovery file to recovery as seen in the image above. d. Ensure that Fastboot Option is disabled on the device. To check, go to Settings >> Power and mark-off the fastboot option. e. YOU CAN FLASH Custom Recovery on any HTC And using this method so long as the bootloader is Unlocked. a. The HTC Device is S-Off. c. The device has a working memory (SD) card slot. 2. Power off the phone or remove battery from it. 3. Move the device specific flashable zip file onto the root folder of the SD Card. 4. Now, slot the SD Card into the phone and boot the phone to HBoot or Bootloader. Power off or remove battery from it then, press and hold the Power + Volume Down buttons together for few seconds or until the screen shows up. Release both keys. Pronto! That's the HBoot screen. Power off or remove battery from it then, press and hold the Power + Volume Down buttons together for few seconds or until the screen shows up. Release both keys and tap the Power button once. 5. Observe the green bar that fills up by the side of the screen and respond to the prompts from the phone to install (flash) the images (in the zip file) on the device. Once successful, reboot your device to the recovery. Pronto! You now have a custom recovery installed. b. S-OFF and has its bootloader unlocked. c. RashR or MTK Mobile Uncle Tools is installed. 2. Download and install either RashR or Mobile Uncle Tools on the phone. 3. Launch (open) either of the apps and grant them root access. 4. Follow the on-screen instructions from either of the apps to falsh (install) the device specific custom recovery on the device.